Or, the post about the thing I thought I'd never do..
Change a layout? I've always been such a big follower of the it's done, put it in a page protector and move on school of scrapbooking. Even when what I see on the page isn't anything close to what I had in my head I don't stress over it. I can only make what I can make: if that's the way it turns out when I start sticking, then that's the way it's going to be. I have more pretty papers to cut up and many, many more stories to tell. Reintroduced a touch of black at the bottom to draw the eye right round the page. 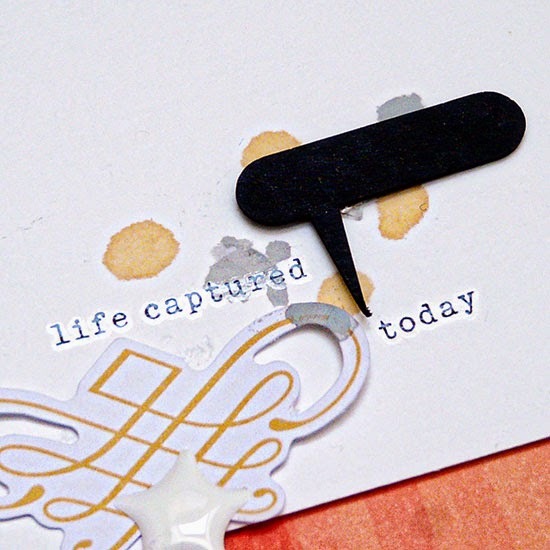 These chalkboard speech bubbles I got in a Jenni Bowlin kit have been my single most useful embellishment this year. A little splash of black AND they say "listen up, here's a story.."
And the biggest change of all? I trimmed off the border music paper and added that much brighter border instead. I don't think I have ever done this before. I love my paper! I've never heartlessly chopped it off and thrown it away! I can't help thinking about what else I could have used that lovely music print for. I was brought up in a house where we learned to fold up brown paper and save little pieces of string: wilful discarding of perfectly good paper? Never. But I did it. And I like the result. I'd go so far as to say I might do it again if I have to. It's fun to experiment and it's good to take a deep breath and just start cutting. And, believe me, the new Sian cuts fast. Maybe I've inspired you to cut? Or maybe I've confirmed you in your belief that walking away once is enough? What do you think? I'm quite sure I would have been quite happy with the first edition, but I think you made some wonderful changes and I loved reading about them. I think the one with the biggest impact was moving Wonderful up to the photo----great idea! Interesting. I loved the first layout so much that I saved it and planned a scraplift. And not just a scraplift where I used your layout as inspiration but an exact copy, or as close as I could get. Then I saw this post and the revised layout. Sorry but I am in love with the first one and although I may agree with the movement of "Wonderful", I believe the first layout was perfection. 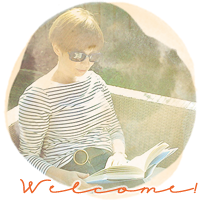 I need to add that I love your style and always look forward to your posts - not only for the layouts (although that is my primary draw) but also your sense of humour and the "slice of life" that you often share with your readers. I will now go back to lurking. While I do love what you've done....and really like the 'new' layout....I have to say the first one is still my favourite....I love the colour [or lack of it!] and slight atmospherics of the music paper for your story. hmm that's a tough one! the colorful background is indeed super awesome!! I did liked the title at the bottom because it created a cool triangle but it does make the photo stand out more that way! 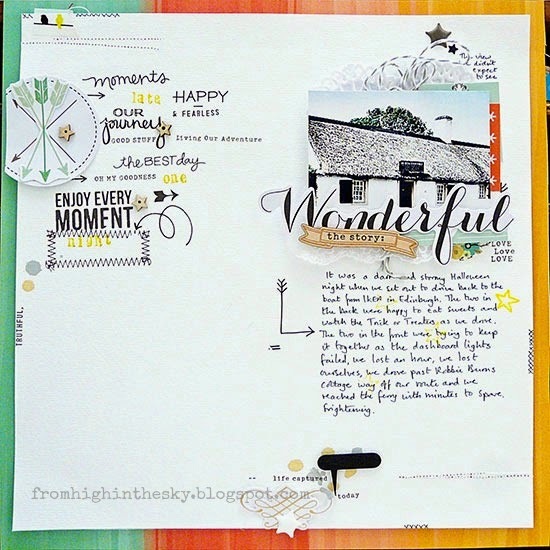 I do feel like calling a layout done is the hardest part of scrapbooking! I totally understand what you're saying, if a layout doesn't feel right, it will be one of those in your album, you'll want to flick over. Both of your layouts are lovely and if I made anything as amazing as these, I'd be over the moon. I wonder what the consensus will be? I like both, but the first version just edges it for me. If I was going to make a change to it, I would have moved the "Wonderful" so that it was just above the scroll, but still at the bottom of the page. It's a funny thing, how a page can look so different (to my eye) once I've photographed it! I like the new version: I especially noticed the big change the new title spot made. Definitely enhances the photo, in a great way. I also like the colorful border better. I agree with moving the title but really like the softer background. It's interesting to see your thoughts behind it all. How interesting, Sian! I'm not sure which I prefer. I did rather like the simple black-&-white, almost starkness of the first layout - it went with the story. I'm with you - I rarely ever go back & change something. I can only think of once that I've done it. But I do like the changes here & that colorful background! I did like the first layout Sian, but I know what you mean about something not feeling quite right and niggling for attention. I think both layouts are great. Like you, I rarely go back to a layout. I just tell myself---"not every layout can be a masterpiece!" 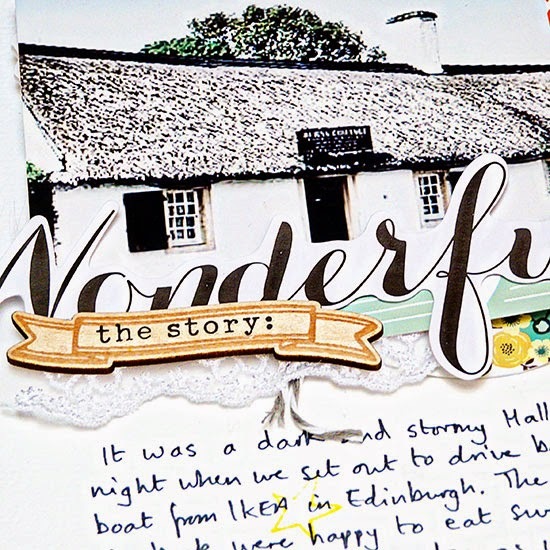 If I were choosing between your two layouts, I choose the second one just because of moving the word "wonderful" up to the photo. That looks great. So it was fun to the hear that little voice in your head tell you to make those changes. Just be careful, redoing can be a very slippery slope. I like them both. I'd not even noticed that the background border was actually a border on the last posting but I'm glad you had a go at something that bugged you! I really liked the original but I think those little changes you made are big and I like this version more. I keep thinking I'd like to change a few layouts I've made, particularly old ones, but I know that's just not going to happen. I loved it before, but love it even more after! Great decision to make those little changes.